COUNTDOWN may has gone down as the most popular music programme in the history of Australian TV, but, sadly, wiping is no respector of status. Though one of the first Australian shows to be made in colour, the majority of editions from Countdown‘s early years (1974 – 8) are now missing, and along with them early performances by the likes of AC/DC and Sky Hooks. From 1979, archive holdings shoot up but even so, only the last series in 1987 is still retained in its entirety. The shows that do remain have enjoyed a second life on Australian Broadcasting Corporation’s all-night music programme Rage, which is how missing episode enthusiast Troy Walters came to be involved in the hunt for lost Countdowns. 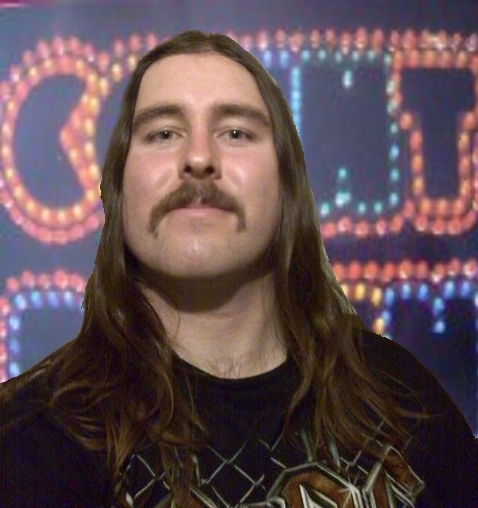 Troy, who hails from the east coast of Oz, describes his biggest passions as “collecting and preserving early Aussie television shows, collecting old video technology and retro music from mostly the ’60s, ’70s and ’80s”. He wasn’t even born in the seventies, but since 2002 has been instrumental in tracking down and returning early music shows, including Countdown, that have been preserved on domestic video recordings. Can you explain to non-Australians what Countdown was, and where its appeal lies. “Countdown was a weekly Australian top 40 pop music program aimed at a teenage audience featuring live performances and music videos of local and overseas artists, artist interviews, music chart segments such as “Chartbusters” and “National Top Ten”, and a news segment on what was happening in the music scene, called “Humdrum”, presented by Ian “Molly” Meldrum. “If you were growing up in Australia in the 70s and 80s as a teen, it was a ritual you watched Countdown every single weekend! “It was a bit like Top Of The Pops but with more segments and variety in between and the show was often hosted by guest artists and talent coordinator Ian “Molly” Meldrum. It’s appeal lies within the fact that the show didn’t just present studio performances and music videos like many pop shows do; it touched on so much more in relation to the music scene and teen culture, from interviews and chart positions to up-to-date musical news. “Also, the show was very informal so artists and the Countdown crew could let loose a bit of fun with jokes and gags, and have a great laugh. An example is Elton John splatting Molly Meldrum with a birthday cake. “Another plus was that the audience was positioned right up close to the performers and researchers went out to selected high schools around Australia to get feedback from students on which music acts were hot and which were not, so Countdown was a very interactive show. How did you come to be involved with the hunt for missing shows? “I was noticing Rage were airing so many more Countdown episodes of the ’80s than the ’70s and I wondered why. I soon learned that most of the 1970s Countdown episodes were wiped from ABC archives under the order of the general manager, which was terrible news to me! “In late 2001, however, I discovered that home video recorders did exist in Australia in the mid 1970s after seeing some missing 1975 Young Talent Time footage featured on the documentary “Young Talent Time Tells All” which can be seen here at 7 mins into the clip. “That footage was taped on an early home VCR by the parents of Young Talent Time member Sally Boyden. This is what inspired me to start collecting old pre-VHS video recorders and tapes to find off-air recordings of missing ’70s Countdowns. I thought if people had video recorders in the ’70s surely some of them would have recorded Countdown. So the hunt began from there and I have since built up a big collection of old video machines and tapes of various formats which can be seen on my Countdown site. http://1970scountdown.atspace.com/vintagevideo.html . How did you begin your search? “In 2002 I launched my Search for long lost Countdown episodes of the 1970s website to put the word out about my quest to find missing Countdowns and make everyone aware (especially those who did videotape Countdown in the ’70s) that ABC didn’t keep all of their episodes and encourage anyone with missing episodes to come forward with them so they could be digitally preserved. “From the launch of my site I have developed a lot of online friends who are very passionate on preservation of television history and have assisted me in finding missing Countdowns over the years or turning up footage. “Around 2003 my site caught the attention of ABC sales manager Simon Kain, who is very passionate on the recovery of ABC music programming. He was pleased with my efforts and kindly provided me with info of what exists of Countdown within ABC. From the information given I discovered that one Countdown episode in my collection that I had acquired in a video trade was missing (tx 16/7/78). “I sent my copy to ABC and they transferred it to Digital Betacam for preservation. I was very happy to know that ABC cared about getting their Countdown collection back and I have since been assisting them with any rare Countdown and ABC music-related footage I come across. What is the survival rate for Countdown? 1975: Five episodes and over 20 clips survive, one episode sourced from an off-air video recording and another sourced from a FM simulcast audio recording. 1976: Four episodes and over 20 clips survive. 1977: Eight episodes and over 60 clips survive, one episode sourced from an off-air video recording. 1978: 10 episodes and over 30 clips survive, one episode sourced from an off-air video recording. 1979: 26 episodes and several clips survive, one incomplete episode sourced from an off-air video recording. What progress have you made with your hunt? “Since getting involved in searching for lost Countdowns in 2002, a few missing ’70s episodes and several individual clips have surfaced, which in my opinion is excellent progress so far! “The missing episodes and clips have been sourced from a variety of video formats, most notably U-Matic and ½” EIAJ standard B&W reel-reel videotape. I have obtained pretty much most of the missing Countdown footage in video/DVD trades with my online collector friends, so I owe much credit to them for finding the footage and kindly providing me with copies. Various Countdown clips from 1978 and 1979 (A music collector has uploaded these clips to YouTube from his collection of Philips N1700 videotapes; his channel can be viewed here. More details on my findings can be viewed on my website here. What has been your most exciting discoveries? “Pretty much all of what has surfaced of the missing Countdowns has been exciting. If I had to pick any in particular I would say the ones that stand out the most would be the 3rd July 1977 episode discovered by a couple of my collector friends and the bits and pieces of Countdown footage from 1975, such as Split Enz clips, Wings footage and Skyhooks’ “Private Eye” music video. Anything from 1974 to 1976 would be my most exciting finds as it was my most favourite era. Are there any Countdown shows in particular still missing that you would love to find? “It’s hard to name any in particular but I would say any episode from 1974 to 1976 featuring AC/DC as they were regulars on the show during that period before they started touring overseas. “If I had to name any shows in particular, one I would absolutely love to see surface is the 20th December 1974 episode featuring AC/DC perform “Baby Please Don’t Go”, featuring Angus Young dressed in a Zorro outfit. Photographs of this performance can be seen on the official Countdown site here. The other would be 29th November 1974, in which AC/DC made their very first appearance on Countdown. Do you search for other missing shows, and if so, how are those hunts going? I have a page on my website listing the main other missing programs I want to find, here. “So far with those shows I have found some incomplete episodes of Nightmoves and Sounds from the early ’80s on beta and Philips N1700 VCR tapes. I am not sure of what exists of those shows in the archives so I am not sure if they are missing or not. “I am also keeping my eyes peeled for missing overseas programs as well, particularly Dr Who as I so happen to be a big fan of the show and we all know much of the early years of that show have been destroyed. Same thing for Top Of The Pops as I am a fan of music shows and am aware of the gaps in the TOTP archive as well. Do you think there is much more missing material to be discovered? “I certainly do! I believe there are many more episodes out there in people’s old video collections and they will indeed surface. I know there are still thousands upon thousands of old videotapes out there in sheds/basements, schools and colleges, and in performing arts museum collections. From time to time, ancient videotapes pop up at markets, second-hand shops, and most notably on eBay and there is always a chance that some of them might contain Countdown footage. I cant get enough of old Countdown episodes, as well as Rock Arena and GTK. I wait all year for Rage to go retro in January, I wish there was a way I could start my own collection! I have observed that sensible real estate agents everywhere you go are getting set to FSBO Marketing and advertising. They are acknowledging that it’s in addition to placing a sign in the front property. It’s really about building associations with these retailers who sooner or later will become consumers. So, once you give your time and effort to assisting these traders go it alone — the “Law connected with Reciprocity” kicks in. Interesting blog post. Also clip for Punkz, Song:Take me for what I’m worth. I was a very young girl when I was on countdown to collect a cheque (Charity) for the Gordon Boys home where we lived. there was Myself, Molly Meldrum and another young boy Richard Burgess with me on stage to receive it. I have been searching for this episode or a photograph..Split enz were there and gave us autoghraphed records. I think it was 1982, I would have been 13.
looking at a list of episodes I am thinking 25th April 1982 as split enz were on that episode, but I can’t be sure. It was one of a few memories I can remember and am desperitly trying to track down that episode. Thankgod for people like you! Some of the episodes missing have had amazing stuff. I do recall Blondie on there being interviewed by Shirley from Skyhooks. The’ Boys Next door’ doing ‘These boots are made for Walking’. A lot of New Wave bands…so sad. Good Luck in this. Mimi Pavlovsky.